New Course Being Piloted Spring 2020! This course develops fundamental conceptual and practical applications of financial management, cost analyses, budgeting and human resource management in the contemporary health care delivery system. Analyze concepts from economics, accounting, revenue and cost analysis, budgeting and financial management in relation to contemporary health care organizations. Interpret financial statements, cost management techniques, operating budgets, variance analysis, cost benefit ratio and cost effectiveness analysis within contemporary health care organizations. Use computer programs to prepare reports for ethical fiscal decision-making. Analyze theoretical and applied research from health care literature in relation to financial management and the managerial role. The application deadline for the September cohort of Advanced Practice Providers (APP) Fellowship at Seattle Children’s Hospital will be May 3, 2019. The one-year APP Fellowship is a way to help new graduate NPs and PAs prepare to provide great pediatric specialty care and to care for a complex patient population. The goal is to teach them to how to practice independently in a collaborative manner within a team. For more information about the fellowship program, please refer to the Seattle Children’s APP Fellowship website. Curious about your graduate degree deadlines? Visit the WSU Graduate School website to stay on track of all the requirements for your master’s or doctoral degree. Did you know that as a DNP student you will have taken all courses required for the Graduate Certificate in Nursing Leadership? The required courses are: NURS 565, Information Management for Clinical Practice, NURS 576, Organizational Systems & Leadership, NURS 553, Practicum in Organizational Systems & Leadership, and NURS 591, Mixed Methods for Program Planning, Implementation & Outcome Evaluation. If you are interested in receiving this certificate along with your degree, you will be required to apply for the certificate in a separate application than your application for degree and pay the $25 certificate application fee. The deadline for applying for the certificate is the same date as applying for your degree. The application was due in Pullman by 3/1/2019 for a spring award. If you are interested in the other certificates in Nursing Education or Public Health, please check the Graduate Student Handbook or talk with your advisor to see if you have met the course requirements. If you have any questions, please contact the graduate program office staff. Spokane, Yakima, Tri-Cities and Walla Walla students, contact Tami Kelley (kelleyt@wsu.edu); Vancouver students, please contact Adriana Thomas (Adriana.thomas@wsu.edu). If you have any questions about scholarships, please access the Financial Aid and Scholarship Web page to access resources. You could be eligible for this scholarship if you are a TA or RA, employed by the CON that is a member of NLN. Keeping your passport consistently current is mandatory regardless of what classes you are taking. Prior to the beginning of each semester, log on to the E*Value database, go to “Other Tasks”, then to “Personal Records Requirements” and update any expired requirement. Please do not delete the expired documentation, just add your new documentation. Also, check your expiration date column and update requirements that are about to expire or schedule the update and add to your calendar with other program obligations. It is your responsibility to keep your graduate passport current throughout enrollment, without prompts from faculty or staff. IMPORTANT: Allowing a passport item to expire could result in a registration hold, a delay or cessation of your rotation until the item is updated and documented, not being able to count clinical hours accrued during the time when a passport item is expired, and/or Notice of Unsatisfactory Performance (NUP). Please be aware that some clinical sites may have additional requirements above and beyond the clinical passport. Students will need to complete these additional requirements in order to do a rotation at these sites. WSU Graduate Passport forms, links and instructions are found on the WSU website. The registrar’s office would like to reach out to all students and ask, “Are you or have you had Veterans status in the past, but are not currently using your benefits?” We would like to honor you with your Veteran cords and the challenge coin you will receive as a Veteran when you graduate. If this applies to you, please contact Jason Trosine, the Spokane Campus Registrar. Thank you. Software Carpentry introduces essential skills for research computing, which can be used throughout researchers’ careers. This is a two-day workshop on April 8th and 9th that is open to grad students! No prior computing experience required. Cost for participation is $25. If you have any questions about scholarships, please access the Financial Aid and Scholarship Webpage to access resources. Didactic program sessions focused on the federal policy process. Go online for more information! S2’s are doing a Valentine’s Day Cookie Gram fundraiser. Heart shaped cookie grams with personalized messages will be available to buy and send to classmates and colleagues in the College of Nursing for $5. To order: e-mail Jacquelyn.deichman@wsu.edu with name, message, and who the cookie gram is for (including cohort) by 2/11. Students can pay cash or venmo Paige Wolter. Please check your WSU student accounts for tuition and fees. Late fees will be assessed on non-paid tuition/fees. Please contact your campus registrar office with any questions or concerns. If you are interested in receiving this certificate along with your degree, you will be required to apply for the certificate in a separate application than your application for degree and pay the $25 certificate application fee. The deadline for applying for the certificate is the same date as applying for your degree. The application is due in Pullman by 3/1/2019 for a spring award. CON scholarship application is now open! Please access the link below to complete your application by midnight on February 22, 2019!! Please check your WSU student accounts and notify the registrar of any issues. Congratulations to all of our MN and Post MN DNP students who are graduating this semester!! In addition, a face-to-face final exam will take place sometime during Week 17 of class (December 10-14). The exact date of the final exam may be different based on the home campus. If you are interested in the other certificates in Nursing Education of Public Health, please check the Graduate student handbook or talk with your advisor to see if you have met the course requirements. Carol Rudy $1,000 Student Scholarship. If you are interested in receiving this certificate along with your degree, you will be required to apply for the certificate in a separate application than your application for degree and pay the $25 certificate application fee. The deadline for applying for the certificate is the same date as applying for your degree. If you have any questions, please contact the graduate program office staff. Spokane, Yakima, Tri-Cities and Walla Walla students, contact Tami Kelley (kelleyt@wsu.edu) or Rychelle Wagner (rmwagner@wsu.edu); Vancouver students, please contact Adriana Thomas (Adriana.thomas@wsu.edu). Influenza vaccines due October 1st! If you choose not to get the vaccine, an Influenza Waiver Form must be signed annually if desired, but be aware signing a waiver may exclude you from placement at some clinical sites. Updated flu vaccine options for this year are now available at most pharmacies, clinics, medical providers, and grocery stores. • Vancouver – All currently enrolled students at WSU Vancouver can receive a flu vaccine for free. They can come by Classroom Building room 160 or call 360-546-9238 to schedule an appointment with Health Services. The vaccines provided free to students are HEP B, TDAP, MMR, Meningococcal, Varicella and flu. For more information, check out the accreditation information. Save the Date Oct. 11! The Spokane College of Nursing Career Fair is set for October 11th from 10:00 a.m. to 1:00 p.m. Agencies will be set up on the first floor and in room 119. If you are in the Spokane area that day, come check it out! In addition, a face-to-face final exam will take place sometime during Week 17 of class (December 10-14). The exact date of the final exam may be different based on the home campus. This date will be announced during the first week of class this fall. The College of Nursing provided more than $413,000 in scholarships to nursing students last year. Numerous scholarships have been established by donors, friends, and alumni who are committed to the education of Cougar nurses. 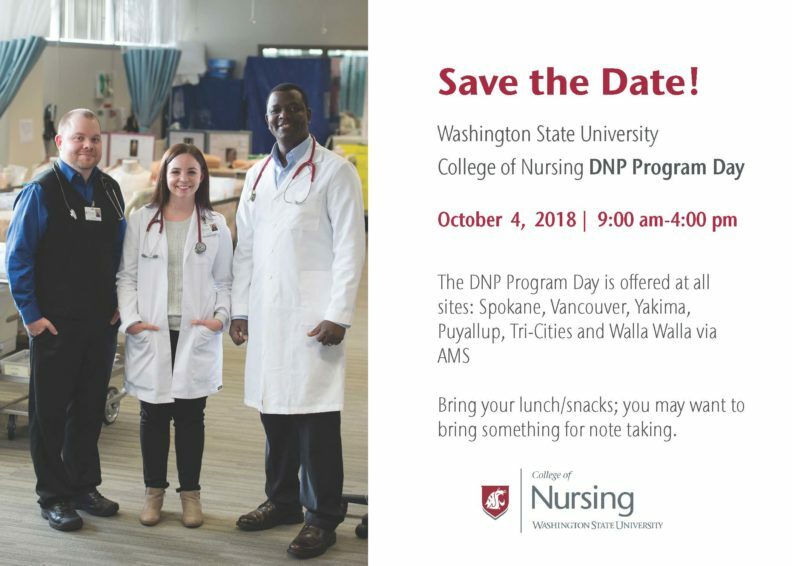 You must be currently enrolled and taking courses as an undergraduate or graduate student at the WSU College of Nursing to be eligible to apply. We ask that you complete your Free Application for Federal Student Aid (FAFSA) as part of the process (international and graduate students are exempt). The College of Nursing scholarship awards are granted bi-annually for fall and spring semesters only. The scholarship portal will be open through Friday, September 28, 2018. You can apply online. If you apply for a spring 2019 scholarship, you will be notified of an award or decline by October 31, 2018. For questions regarding the scholarship process, application, or awarding please contact: Deborah Blake, Assistant Director of Development & Alumni Relations, nursing.scholarship@wsu.edu, (509) 324-7339. The award provides support for students in programs of study that will qualify them to practice as an advance practice nurse with a specialization in oncology. This scholarship is available to graduate students pursuing a master’s degree in nursing or a Doctor of Nursing Practice. Students in qualifying post-master’s certificate programs may also apply. Applicants must be accepted to an accredited graduate nursing degree program and be licensed registered nurses at the time the scholarship begins. The program of study must be offered within an academic institution (non-profit only) in the United States that can award an advanced nursing practice degree with demonstrated integration of cancer nursing content, or the applicant must demonstrate previous advanced practice oncology nursing training. The student must be advised by a faculty member responsible for the oncology nursing content in the curriculum or program of study proposed for the applicant. The annual scholarship stipend is $10,000, and includes subsistence and tuition expenses. Scholarships are awarded for a minimum of one and a maximum of two years of funding. Continued funding is contingent upon satisfactory progress in the graduate program as documented in the student report. For more information about the scholarship—including instructions to join the call—consult the American Cancer Society website. Choose “Apply for a Grant” > “Grant Types”. Doctoral Scholarships in Cancer Nursing provide support for study in a doctoral degree program in nursing or a related area that will prepare the graduate for a career as a cancer nurse scientist. Applicants must possess a current license to practice as a registered nurse, and be enrolled in or applying to an accredited doctoral degree program. Students must project a full-time program of study that integrates cancer nursing and provides evidence of faculty support. Awards are made for up to two years, with possibility of renewal based on satisfactory progress. The yearly stipend is $15,000 per year, which includes subsistence and tuition expenses. For more information about the scholarship—including instructions to join the call—consult our web site: www.cancer.org/research. Choose “Apply for a Grant” > “Grant Types”. CHAS is accepting applications for its Nurse Practitioner Residency Program, in anticipation of hiring three residents to begin in September. For more information on the program, visit the CHAS Health website. WSU Spokane has a contract with Rockwood to provide a number of health services to students for free. If you are a full-time student, your student health fee covers the cost. WSU Spokane Health Services webpage. In addition, a face-to-face final exam will take place sometime during the week 17 of class (December 10-14). The exact date of the final exam may be different based on the home campus. This date will be announced during the first week of class this fall. The scholarship portal will be open from Monday, August 20 through Friday, September 28, 2018. You can apply online. If you apply for a spring 2019 scholarship, you will be notified of an award or decline by October 31, 2018. The award provides support for students in programs of study that will qualify them to practice as an advance practice nurse with a specialization in oncology. This scholarship is available to graduate students pursuing a master’s degree in nursing or a doctorate of nursing practice. Students in qualifying post-master’s certificate programs may also apply. Applicants must be accepted to an accredited graduate nursing degree program and be licensed registered nurses at the time the scholarship begins. The program of study must be offered within an academic institution (non-profit only) in the United States that can award an advanced nursing practice degree with demonstrated integration of cancer nursing content, or the applicant must demonstrate previous advanced practice oncology nursing training. The student must be advised by a faculty member responsible for the oncology nursing content in the curriculum or program of study proposed for the applicant. For more information about the scholarship—including instructions to join the call—consult the American Cancer Society website. Choose “Apply for a Grant” > “Grant Types. For more information about the scholarship—including instructions to join the call—consult our web site: www.cancer.org/research. Choose “Apply for a Grant” > “Grant Types. March 1 – Annual Reviews were due March 1st! Please contact your adviser to meet NOW if you haven’t completed yet. Deadline: June 30, 2018Apply now! Each spring the Inland Empire Nurses Association offers $1,000 scholarships to nursing students. For more info, please visit the IENA website. WSU Graduate Passport forms, links and instructions are found on the WSU website: https://nursing.wsu.edu/current/admitted-students/. 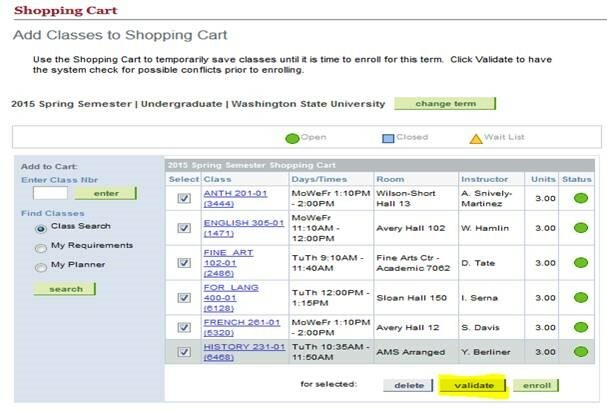 A validate button is available in the shopping cart for students. 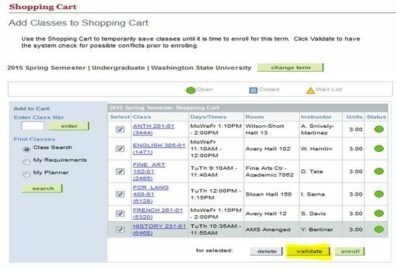 The validate button enables students to identify issues that will prevent them from enrolling in classes that have been placed in their shopping cart. Students should validate their shopping cart early and resolve enrollment issues prior to their scheduled enrollment appointment date and time. Use of the validate button is optional for students. The validate button does NOT enroll students. Students must click the Finish Enrolling button to enroll in classes. Go to myWSU and sign in. At the homepage, you’ll see the student center and from there choose “Go to my Student Center”. Click the select box(s) next to the class you want to validate. Enrollment issues are noted with a red X under the status section. You should resolve these prior to your enrollment appointment date and time. When your enrollment appointment arrives you are only able to enroll in classes with the green checkmark. NOTE: the “validate” button does NOT enroll you in classes. You must click the “Finish Enrolling” button. Click the Shopping Cart button to return to your shopping cart. You can help make the SILENT AUCTION a success. Get together with your fellow graduate students to compile a box or basket of items unique to your region for sale at the Silent Auction! Monies raised through the Silent Auction fund WIN member services, which directly benefit students, including: WIN Poster Awards (includes student awards), Grants from WIN in partnership with Sigma Theta Tau International (STTI) and the American Nurses Foundation (ANF). IF YOU WANT TO PARTICIPATE, get together with fellow students to plan your basket or box by including items that are unique to your region of the west. Use the Silent Auction Donation Form found on the WIN website to notify the Silent Auction Committee of the intended donation. Send or deliver the completed form with your item(s) in advance to Dr. Neva Crogan, 328, Department of Nursing, Gonzaga University, 502 E. Boone Avenue, Spokane, WA 99258-2616 or bring your item to the conference registration desk on Wednesday, April 11 or Thursday, April 12. Are you looking for opportunities to provide care in rural or under-served areas? There are many positions, some of which offer loan repayment! As a PMHNP nursing student who is about to join the field in the next several months, you are probably considering your options for practice. For many this will include traditional clinical settings and for some this might involve private practice, where you typically will trade out the support of a clinic for more freedom and autonomy. We’re writing to let you know that you now have a third option — a new practice model that we think provides the best of both worlds. With over a decade of private practice experience between us, Todd and I know all too well that being a solo PMHNP means scheduling, billing, responding to calls and emails, securing prior authorizations, keeping up with the latest research and coordinating with other providers, not to mention the less urgent but no less important tasks of keeping up with HIPAA requirements, shifting insurance requirements, and legislative changes. We created Calico to serve the many skilled and caring PMHNPs in the Portland area who love the independence and flexibility of private practice, as well as the increased earning potential, but are becoming overwhelmed by the administrative demands, the legal risks, and the clinical isolation. By joining Calico, the independent providers we hire can choose their office location, choose the clients they want to see, take as much time off as they want and maintain the schedule that works best for them, while receiving all-encompassing administrative support that frees them up to focus on doing what they do best. Calico also can help you with one of the primary challenges facing new independent providers: building a client base. Todd and I both have a robust network of referrals from fellow mental health clinicians and primary care providers in the city, and our practices are quite full. Consequently, we have to turn away many people looking for services who we are simple not able to fit in. To achieve our goal of being a resource for the community, we need the help of new PMHNPs like you. For us, another big part of Calico is overcoming the inherent disconnection of private practice. Being a part of a group can expand one another’s knowledge base tremendously. Rather than waiting for the monthly case consult, or trying to get one of our busy colleagues on the phone, we will have easier access to one another through our IT infrastructure on a day-to-day basis. Our dream is to have many different kinds of providers, with many different clinical interests and areas of expertise, who we can all access for the improved care of our clients. Working together in this way raises our collective game. The emotional support is just as important as the logistical support. Working in the mental health field can be incredibly rewarding, but it can also be emotionally draining. Some days, it’s not just about having access to the information that our fellow provider possesses, but also the interpersonal support involved in that exchange. Accessing the reassurance and understanding of a fellow clinician, in addition to the clinical advice they might provide, is invaluable. Additionally, as a PMHNP-owned and -managed group, Calico offers a way to promote nursing values in a visible and trusted way in our community. In no other specialty does the subjective experience of care account for so much of the outcome. We offer an important alternative to the medical model of mental health treatment, which we know is not a great fit for many of our clients. But how many people have we encountered in the world who not even heard of a Psychiatric Mental Health Nurse Practitioner? Together we can fix that. If you are considering private practice but have felt daunted by the challenges and risks of doing it all yourself, or if you’re just excited at the prospect of participating in a new model of care, we’d love to speak with you more to see if Calico may be a good fit for you. We’re deeply committed to supporting the recent graduates who join us. Your success is our success. You can call Amber at (971) 254-3250 to set up a time. Meanwhile, you can find out more about us at www.calicomh.com. March 1 – Annual Reviews are due! Please contact your adviser to meet during the spring semester. Don’t forget!!! The WSU College of Nursing scholarship application portal will close on Friday, February 23, 2018 at midnight. Don’t miss this opportunity to apply for a fall 2018 scholarship! Visit the Scholarships page on the website for a link to the College of Nursing scholarship application for Fall 2018 funding. For questions, please contact Deborah Blake, Assistant Director of Development & Alumni Relations. Thundermist Health Center in Rhode Island Thun is offering a post graduate PMHNP residency program and they are now accepting applications. Applications are due March 15, 2018. Visit their website for more information. Keeping your passport current is mandatory regardless of what classes you are taking. Prior to the beginning of each semester, log on to the E*Value database, go to “Other Tasks”, then to “Personal Records Requirements” and update any expired requirement. Please do not delete the expired documentation, just add your new documentation. Also, check your expiration date column and update requirements that are about to expire or schedule the update and add to your calendar with other program obligations. It is your responsibility to keep your graduate passport current throughout enrollment, without prompts from faculty or staff.